I’ve set a challenge on GoodReads to read 52 books this year. The first new one I started was Night Circus by Erin Morgenstern. Last year I stumbled upon a game called Fallen London. One of FailBetter Games’ other projects was Night Circus. Both projects are interactive stories based around a card and inventory system. 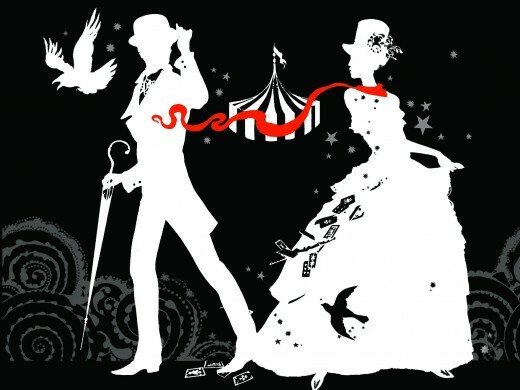 While Fallen London works better as a game-like interactive story, Night Circus’ story held me captive. I knew there was a book, so I stopped playing. I kept getting cards I just used or couldn’t use, so it would’ve taken me a lot of waiting time before I knew the whole story. I went to London for some Christmas shopping and of course I went to Waterstones. That’s where I found the book. 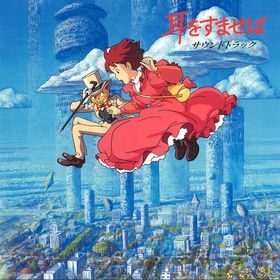 Ghibli Studio’s Whisper of the Heart is my favorite movie. Yes, it’s a children’s movie, animated by the Japanese version of Disney studios, but I can’t help it. The story revolves about a young girl, Tsukishima Shizuku, who spends her summer vacation reading books instead of studying. All the books she borrows from the local library have one thing in common. A boy called Amagasa Seiji borrowed them before. She reads a lot of fairy tales and imagines Seiji as her prince charming. During her vacation she encounters a ‘jerk’ and she strongly wishes Seiji isn’t like him. At the end of the summer vacation she finds out the two boys are the same and that he isn’t a jerk. She just misunderstood. Seiji tells Shizuku that his dream is to become a great violin builder and that he wants to go to Italy to pursue his dream instead of going to high school. Shizuku get inspired to find and follow her own dream, writing. I won’t tell you the ending, but I’m sure you can guess. I love this movie because of its theme, follow your dreams. I think more people need to find their dreams and work to pursue them. I always feel inspired by this movie and it makes me want to work harder to get where I want to be. What makes this movie even more special to me is that my dreams is also writing. When I’m down or have a writer’s block, I have to watch or read something that inspires that me. Whisper of the Heart is one that never fails to do so. Miyazaki Hayao’s magic is one that keeps enchanting people. His magic is of all ages and never becomes old. All of his movies have a setting that you can only create when you wonder. You can’t think of something like The Cat Returns or Ponyo without that wonder. Watching any of his movies triggers my wonder ability. Of course there are other works with themes about passion and dreams. Bakuman is another one in the same category. But I wouldn’t watch Bakuman to get inspired. I would watch it when I need a reminder to work hard. Talent becomes nothing without hard work. Bakuman is a long running manga in the Japanese weekly magazine Shounen Jump. Last year the anime adaption started running and soon the second season will begin. 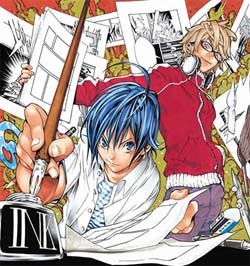 Bakuman is about two boys, Moritaka Mashiro and Takagi Akito, two aim to be successful mangaka. Their dream is shared by Takagi’s girlfriend, Miyoshi Kaya, and Mashiro’s fiancee, Azuki Miho, who has promised to marry him when she gives her voice to Mashiro’s heroine. Bakuman follows the four youngsters through their middle school, high school and college years until they become successful. The manga is still ongoing so the end is still not written. I think it’s very interesting to see how manga is made and how a magazine like Shounen Jump actually works. This manga gives the reader a perfect insight to what the authors of their favorite works have to go through to create what the readers hold in their hands. That’s what I think is beautiful. Fun and some education combined. But this manga is still close to other Shounen Jump manga, like One Piece, Naruto and Bleach. We learn from Bakuman that most successful manga in Shounen Jump are battle manga and while this manga is about creating manga, there are battles. Mashiro and Akito have to fight for their serialization and they even have to beat their rival and friend Nizuma Eiji. I read this manga to get inspired to always give my all to get one step closer to my dreams. The support characters in this manga inspire me the most, because they aren’t called ‘geniuses’ and most of them aren’t as talented as Mashiro and Akito. It shows that even when you’re not very talented, hard work can be enough to get where you want to be.